I’ll always remember the day Dad taught me how to ride “a big girl’s bike.” He tried to prepare me after he took the training wheels off my fluorescent pink Huffy bicycle, which I had decorated with stickers and streamers. On two wheels, I biked around the driveway for a few minutes, wobbling and trying not to fall. Then I headed out of the driveway and biked up the small incline at the end of my street. Dad power-walked alongside me, telling me to stop at the top. “We just took your training wheels off, Mal. You can’t go down that hill,” he said, sounding doubtful. That probably wasn’t the best thing for him to say. When someone tells me I can’t do something, I want to prove to them that I can. Determined, I took off down the Arch Street hill, concentrating hard and hoping I wouldn’t fall. “Mallary!” my dad yelled, running after me, a hint of frustration in his voice. At the end of the hill I put my feet down, my sneakers sliding across the pavement, and stopped. Dad’s nervousness turned into disbelief. “You did it!” he said. I was reminded of this memory last year while zip-lining in Costa Rica. I’m afraid of heights, so the thought of being attached to a cable and flying above a canopy of trees scared me. But my friends encouraged me, so I decided to be brave and do it. I ended up loving the experience and was grateful I didn’t stay behind and watch my friends have fun without me. I used to do this whenever friends and family went on roller coasters. A couple of weeks ago, though, I decided I didn’t want to wait behind any longer. While visiting my cousins in Magic Kingdom I went on my first roller coaster — Space Mountain. It’s not the biggest roller coaster in the world, but it’s a coaster nonetheless! I screamed during most of the ride and held on so tightly my arms were sore the next day. Now I want to go on another one. 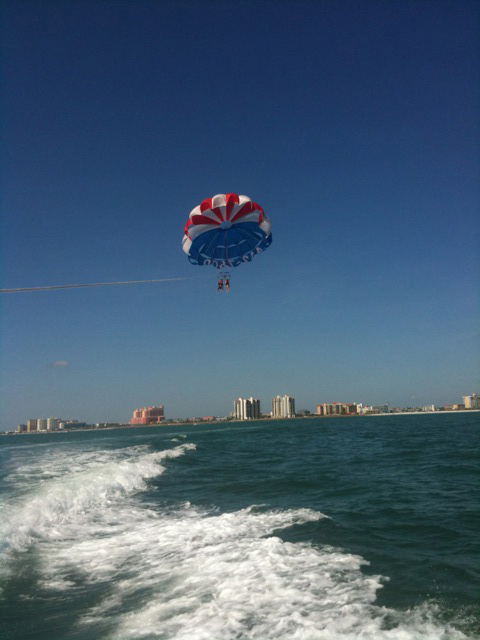 Last weekend I faced another fear: parasailing. As expected, I was tempted to back out once I got on the boat and saw how high up I would be, but I reassured myself I could do it. I held on tightly and closed my eyes until we were almost all the way up, trying not to remind myself of the parasailing accidents I’ve heard about throughout the years. When we were nearly 800 feet above the water, I opened my eyes to see birds flying below and miles of open water. I was struck by how quiet and peaceful it was up there, and by how small I felt. I didn’t want it to end. Zip-lining, parasailing and going on a roller coaster are my modern day equivalents of taking off the training wheels. In facing some of my fears, I realized I had nothing to be afraid of but a lot to gain — namely, confidence in myself and a little adventure in life. This isn’t to say I’m going to start skydiving and bungee jumping anytime soon, but it’s a reminder that sometimes our greatest fears can turn into some of our most enjoyable experiences. Sometimes, even when we’re afraid of falling, we just have to hold on tight and hope we’ll be alright. Next on my list? Jet-skiing or water-skiing. I enjoy some smaller roller coasters (like Space Mountain–it’s fun! 🙂 But I don’t know if I could do parasailing… eek! I’m impressed you did that!